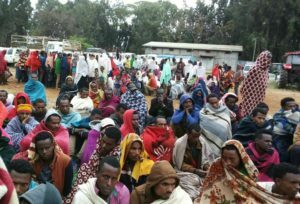 AHRE strongly condemns the continued displacement of Amhara people from their home in Kemashe Zone, Benishangul Gumuz region. According to our local sources, more than 530 ethnic Amhara households (each household has from 2-8 members) have been forcefully displaced from their land and forced to leave their home. We have received credible reports that local authorities ordered armed militias and other residents to attack Amhara people who settled in the area for many decades. The recent attack started in October 2017 and continued till end of April 2018. During the attack 13 ethnic Amhara people were killed and at least 50 others were injured. Thousands have fled to the neighboring Oromia region and to the capital of Amhara Region, Bahir Dar for shelter. AHRE has the names of the victims and official documents which show their legal status as residents in the region.